After spending the night at the South Col, otherwise known as Camp 4, we are spending the day relaxing and getting mentally and physically prepared for a potential summit attempt this evening. As usual, we are monitoring various weather forecasts from around the world. The predictions of decreasing winds have been reversed and it seems as long as computers are going to govern our decision, we will never leave for the summit. The winds have been consistently ripping through the Col at between 20 - 40 knots not ideal conditions for climbing the highest mountain in the world. However, Lakpa Rita Sherpa, our Sirdar, a veteran of fourteen Everest expeditions, has a good feeling about the weather. Although living at the South Col is no different to being in a wind tunnel he and Dave feel the winds up high will not be so bad and are optimistic about our summit bid. We decide that if we leave for the summit it will be around 9.30 pm. The team will be Dave Morton, Jose-Luis Peralvo, Lakpa Rita Sherpa, Danielle Fisher, Esther Colwill and I plus our 5 climbing Sherpas Mingma Tshering, Kami Rita, Tsheri, Nima Nuru, and Tshering Dorje. Dorji and Pemba Chuti, who have both summitted Everest will be supporting from the South Col in case of emergency and Willi Prittie will be co-ordinating events on the radio from Camp 2. Ellie, our Base Camp Manager, will be providing support from Base Camp. What makes this even more remarkable is that this was the exact verse we read when we left Base Camp for our final summit bid. It feels like a good omen to all of us. The day wears on. The South Col is a desolate place and spending any extended period of time at an altitude of 7950m is not good for the human body. We have already been at Camp 2 for 4 nights and Camp 3 for one night so we can not put off our summit attempt much longer as we will continue to lose strength with each passing day. Everyone is anxious and conscious of the fact that we need to make a decision. So far, in the worst weather on the South side of Everest in 45 years, there have been only two summit days, May 30 and 31. Will we get our chance? I am sharing a tent with Jose-Luis from Ecuador, whilst Dave Morton shares a tent with Esther and Danielle. Jose-Luis and I start to get all our gear together and make our final preparations. We go over every piece of equipment thinking through all the issues as do the other members of the team. Dave Morton holds a radio call with Willi Prittie, our expedition leader. Dave tells Willi he thinks it�s time for our shot. All systems go. Jim Williams� team will alo climb tonight as will the team from the University of Singapore plus two Brazilians. There should be about 25 people making a summit attempt which is a reasonable number that will not create any bottlenecks. 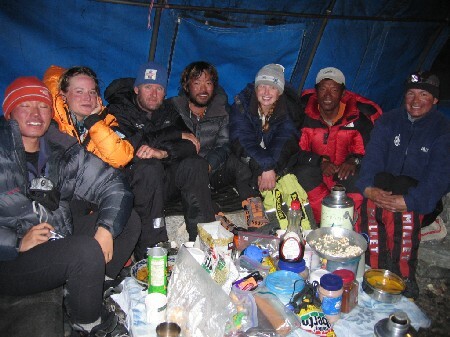 The Sherpa cooks bring around some dinner at 8.30pm � Jose-Luis and I cannot eat anything. We get dressed in all our layers and full down suits, load our oxygen bottles in our back packs, plus all other survival items. Prime time. Lakpa, Tshering and Tsheri are at the back of the group with me. Lakpa runs events on summit day and roams up and down as the need may arise. 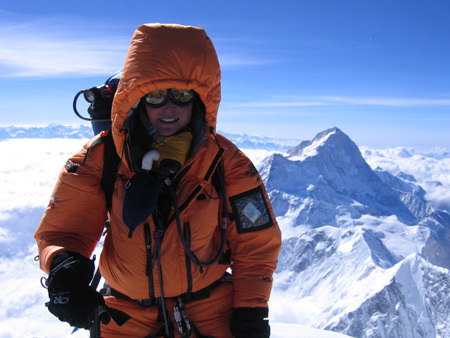 Last year I climbed Cho Oyu with Lakpa and I have seen his power above 8000m, he is awesome. I stop to throw-up. This problem has been plaguing me the whole expedition, the medical reason not yet fully explained. Climbing Everest is hard enough without having to deal with this sort of challenge. I start to panic thinking I will lag too far behind. Lakpa says we are on schedule. I slow down and just go at my own pace, concerned I don�t have the energy to get to the top. Esther, Danielle, Dave and Jose-Luis are way ahead. Esther is climbing on 4 litres a minute after negotiating extra oxygen from Mustafa who left the expedition. Normally, at the back of the pack, at this flow rate she is a powerhouse. I am on 2,5 litres a minute and Lakpa turns me up to 3 litres a minute to give me a boost. Danielle, at 20 years old, seems genetically designed for high altitude and nothing slows her down. I catch up with the rest of the group at the Balcony (8,300 meters, 27,300 feet), where they are taking a rest. As soon as I arrive they take off. Lakpa says he normally reaches the Balcony when day light breaks, we are over an hour ahead of that schedule. Dave, Jose, Esther and Danielle must be almost an hour ahead of me. I decide that the only thing I can control is myself. I reach for a water bottle and realize its frozen solid. I secure it to a fixed line, the extra weight is just a burden. I stop on the way up to the South Summit, clip in to an anchor and enjoy the view. Tshering does some video and I take photographs�you have to enjoy the journey. Dave, Jose-Luis, Esther, Danielle with Mingma Tshering, Kami Rita and Nima Nuru reach the South Summit. I finally reach the top of the South Summit and find Lakpa there waiting. After being sheltered from the wind up to the South Summit we are now totally exposed. The wind is ferocious and it is now extremely cold. The traverse from the South Summit via the Hillary Step to the true summit has to be some of the most dangerous high altitude climbing I have experienced. I can see the whole summit ridge and can see the rest of the team in the distance. We swap out oxygen bottles and we move on. There are plenty of climbers behind me so I don�t feel so bad about my progress and we are way ahead of cut off times. Jose Luis Peralvo, Esther Colwill, Mingma Tsering Sherpa, and Nima Nuru Sherpa step onto the summit. Shortly after Dave Morton, Danielle Fisher and Kami Rita arrive. They have made record time. Lakpa and I traverse the summit ridge and approach the Hilary Step. There are a mass of fixed lines left over from previous years. We climb the Hillary Step and continue along the summit ridge. As we do so the rest of our team is descending. �5 minutes to the top�, they say. 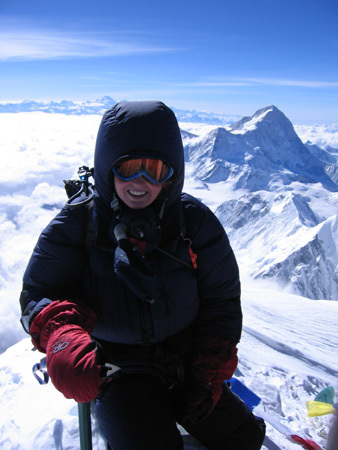 I don�t like being at the back�how wrong could they be�Danielle has just made history by becoming the youngest person to complete the seven summits at 20 years of age�a stunning achievement ! The final 100m to the summit is a snow slog, yet the summit never appears. I still cannot believe I have actually got this far. All day long as we reached one milestone after another I was satisfied. If I had to turn around I could say I tried my best. But here we are�a dream to be realized. With the wind almost blowing us off the summit we reach the top of the world. Lakpa prostrates himself and pays his respects to Chomolungma, a sacred mountain in Sherpa culture. I collapse on the top, recite Psalm 121 and weep. There are prayer flags on the summit and the view is spectacular. We take the customary photographs. I attempt to take photographs with the flag and mascot of the Red Cross Children�s Hospital of South Africa, the South African flag and the flag of my equipment sponsor, Due South. The windy conditions make it almost impossible as the flags are ripped from my hands by the wind. Lakpa radios Base Camp and Willie at Camp 2 with our success, there is a massive cheer over the radio as many people have come to listen in. It feels good. The weather conditions are deteriorating and it�s time to descend. I am sick once again and the tank is empty. Most accidents happen on the descent and I realise I am in poor condition for this challenge. Dave, Jose, Esther and Danielle get back to Camp 4 at 11.30am. I continue to be sick on the way down becoming at times disoriented. I have no food or fluids in my system and am severely dehydrated. As we descend the triangular face we discover a solo female climber in distress. She is stumbling and falling on the fixed lines. Her climbing Sherpa had left her when he also got sick. She is snow blind in one eye with limited vision in the other. Lakpa short ropes her down to the bottom. I stagger into Camp 4, a basket case. But everyone is back safe and we have summitted Everest. I feel no joy only pain. Everyone spends the rest of the day recovering knowing we have to descend to Camp 2 the next day and Base Camp the day after. I still cannot eat or drink and struggle to get calories in my system. We all go to sleep exhausted. All of our team summitted which is quite an achievement.Two climbers from Jim Williams� Team have been successful as have 4 members of the University of Singapore. One of Jim's climbers is snow blind and Stephan has a mild case of frost bite, but everyone will be ok.
We spend the next two days descending another 2,700m down to Base Camp all dealing with our own particular challenges. After over 8 days above Base Camp we are exhausted, dirty and relieved to be going downhill. The final descent through the Western Cwm and the Khumbu ice fall is particularly treacherous as massive crevasses have opened up in the Cwm and the ice fall has experienced numerous collapses. Navigating the icy labyrinth of the ice fall requires the utmost concentration with events not under the control of the climber and I personally cannot wait to complete this final obstacle. So here I am sitting writing this final missive. This has been the journey of a lifetime for all of us. In one of the strangest seasons in 45 years on Everest there has been tragedy, pain, frustration, danger and joy. One thing we can say is that the Alpine Ascents International team conducted itself with a high degree of professionalism, the utmost care and attention to safety and with the highest respect for the mountain. It is now time to go home. We will be walking out on June 6 and expect to arrive in Lukla on June 8. From there we fly to Kathmandu on June 9 where after we all go our separate ways. By the time I get home I will have been away over 70 days on an epic journey. I feel privileged and humbled to have been part of this experience. However, it would be short sighted of me not to pay credit where credit is due. First of all to our mighty Sherpa. We only walk in your footsteps. There is no doubt we would not have succeeded without the enthusiastic and untiring efforts of our Sherpa team ably led by the best and most respected Sirdar of them all, Lakpa Rita Sherpa. They are strong yet proud, powerful yet humble, egoless and polite � can there be a more wonderful, gracious people on this Earth? 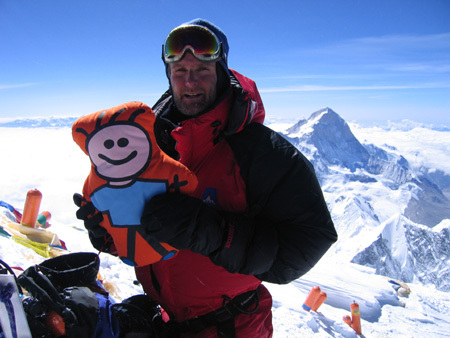 We all thank the Sherpa for making this expedition a success. In addition, on behalf of the climbers, we need to thank Willi Prittie, our expedition leader and his fellow guides Dave Morton, Jose-Luis, Vernon Tejas and Lakpa Rita Sherpa for their leadership, guidance, knowledge sharing, commitment and friendship. It is a pity not all the climbers could stay to the end. For those who left early, your presence was sorely missed. Finally, after all is said and done, friendships have been fostered, camaraderie has been enjoyed and pain has been shared. These bonds are not easily broken.